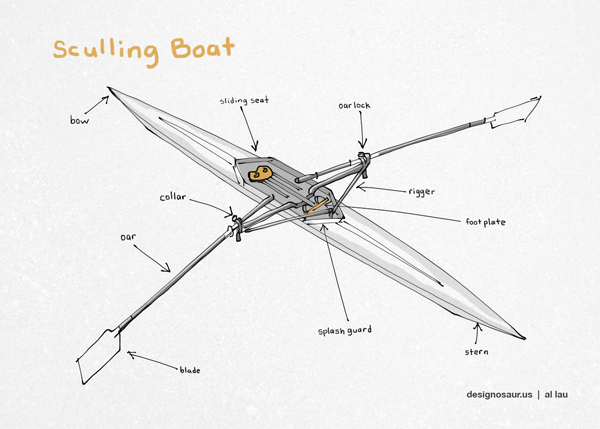 The sport of Sculling is all about speed, in addition to power, aerodynamics and synchrocity. It involves oars that propel the shell, in unison, on both sides of the boat – port and starboard. (There is such thing as single-oar sculling as well.) Boaters are seated opposite the direction the craft is headed toward. This is because there is more strength developed from the motion of pushing back with the legs and arms. Single, double, quadruple or even more rowers can occupy the watercraft, depending on the length, from about 26 to 65 feet. The width is so narrow that the boat only becomes stable when the oars are counterbalancing like outriggers. So maintain your center of gravity or you may take a spill! My drawing, here, is of a single-person sculling boat.